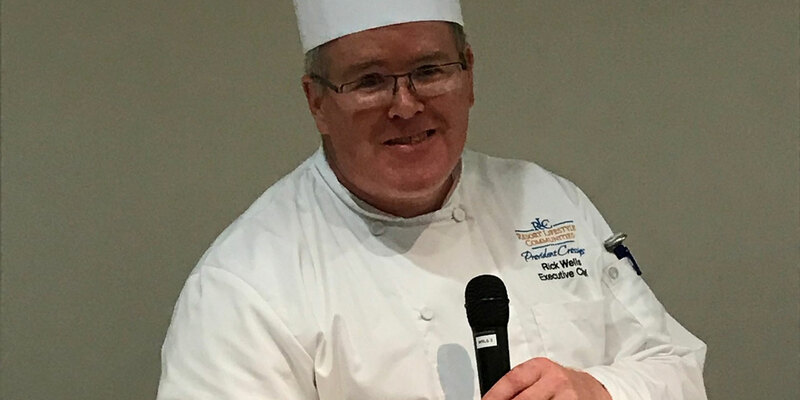 If you dine with us at Provident Crossings and just happen to hear an Irish melody coming from the kitchen, that’ll be our very experienced and talented Executive Chef Rick. Not only does he sing in the kitchen all the time, but he’s also an accomplished saxophone, flute, trumpet, trombone and woodwind player of any kind. Chef Rick was born in Fort Worth, Texas but moved with his family to upstate New York when he was 15. There, he graduated from Broadalbin High School and earned an associates degree in general studies from Fulton Montgomery College and a bachelor’s degree in hotel and resort management from State University of New York, Delhi in the Catskill Mountains. He also graduated from Hyde Park, New York’s famous Culinary Institute of America with high honors. Chef Rick and his wife Jennifer have three children, a 26-year-old daughter Alyssa, who works as front desk manager at the Disneyland Hotel, a 17-year-old daughter Emily, and Luke, who is eight. He started working at age 15, making pizza for a hotel, and also at a restaurant called The Turkey Farm, where the proprietors raised their own turkeys for homemade pot pies. He eventually ended up as Executive Chef for five restaurants at the Empire State Plaza in Albany, New York, two French restaurants, and the famous race course in Saratoga Springs, New York. He was also Executive Chef at University of Oklahoma Medical Center and Children’s Hospital for five years and later at St. David’s Medical Center in Austin in the same position. Prior to joining Resort Lifestyle Communities, he served as Regional Chef for SODEXO, a contract food service for hospitals and seniors. Chef Rick likens cooking to ministry work, and says he’s humbled by being able to provide good, nourishing, and restorative food to seniors. In his spare time, our singing chef likes gardening, reading, snow skiing and sports, especially football.